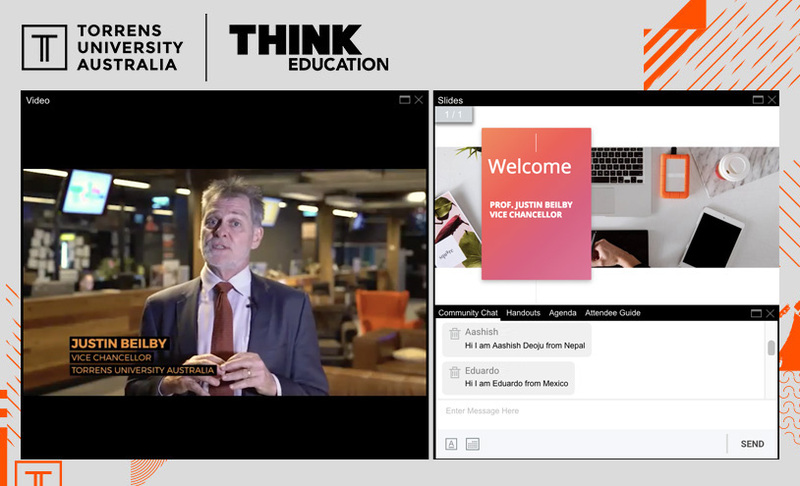 Our Online campus is home to Torrens University Australia and THINK Education. Subject Selection is now open! Classes have limited spaces so make sure you plan ahead and lock in your subjects now. Fashion Revolution is a global initiative that aims to change the way our clothes are sourced, produced and consumed, so that our clothing is made in a safe, clean and fair way. Donations will go towards our Here for Good event which will be hosted offsite in Week 10, where our Branded Fashion Design students will volunteer their time and apply their skills in helping men and women from our community select a wardrobe to help empower and improve their employability. Are you located in Sydney and want to donate? Bring your pieces to our Ultimo Campus on Level 1 opposite the lifts and drop them off in the boxes provided! If you would like to get involved, please contact Pirra Giffiths. Are you a Billy Blue or Media Design School student? We’re challenging you to think beyond traditional ideas and create the unexpected. To frame your work in a new light. With the streets as your subject, you’re invited to capture your surroundings in a way only you know how. We’re looking for the everyday shown in new and exciting ways. Using equipment hired (for free) from the Design Technology Store on campus, or using your own, you will be taking street photography (also known as urban photography). Looking at the everyday lives of people in public places, your photos will need to include an urban setting and a human element. Digital manipulation in post is permitted, but to only enhance the authenticity of the moment captured. Details on applicable adjustments see below under the heading Digital Manipulation*. Open to all students at Billy Blue College of Design, Torrens University Australia and Media Design School, you will need to sign up to Frontier to participate and submit. All entries will be shown in the gallery below and later judged for prize-winning submissions. See prizes on https://www.wearethefrontier.com/competitions/ Judges will be selected from each campus to ensure fairness. Submissions close midnight 26th April. Those keen to join us on the upcoming Morocco trip. Also check out the Design Facebook pages for more information. Q: Can I extend my trip afterwards and head over to Europe in the break? Absolutely you can! And many students normally do. Let Lisa know. Q: Is this trip capped to certain amount of students across all streams? Yes- to a total of 35 students - first in first served! Q: I’m an international student - can I go? Q: If I partake in WIL while there, does that mean that subject is done then? Pending passing it, yes, that’s correct. One subject knocked off in a few days! More information on the times, dates and locations of these workshops to come. Watch this space! 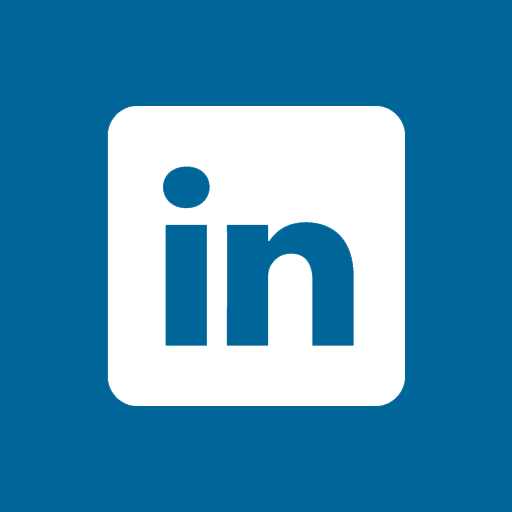 Do you have a LinkedIn account? Wondering how you can use this social media platform to leverage your career prospects? Do you know how to brand yourself and increase your network? If you missed this online workshop, do not worry here is the recording link! Need help to make sure that you're using SketchUp to industry standard? Having trouble using SketchUp for your assessments? Join us for our weekly SketchUp workshops on Wednesdays, facilitated by one of our design lecturers! You will receive assistance with developing or up-skilling your existing skills in SketchUp. Make sure you have the latest version of SketchUp Pro or SketchUp Make installed on your computer. Learning Services will work with you so you gain the vital skills required for achieving academic success. In this workshop we will provide you support with: Time management, analysing briefs, finding reliable information, academic integrity, structuring assignments, academic writing, oral presentations and much more.. These services are available online and face-to-face. Choose the one that works better for you and book now! *Note: There's no need to book, just show up to a session. Calling all Online Design Students! Having trouble using Adobe Software? Don't know your InDesign from your Photoshop? Join us for design software workshops, facilitated by one of our design lecturers. To join the online sessions please click here. Click here to watch this short 6-minute tutorial to assist you with setting up Collaborate - you will only need to set this up once. Please always ensure you set up your collaborate before joining the session (a good 15min). Please note: Students need to have the latest version of the Adobe Creative Suite. Please arrive 15mins early so we can start on time. Did you miss an online workshop? Check out the workshop recordings here. These workshops are only open to design course students at Billy Blue College of Design. Students need to bring their own laptop and have the latest version of Adobe Creative Suite. Please arrive 5-10 minutes early so that the workshop can commence on time. Need assistance with making sure you have the correct Adobe programs installed? Please watch this introductory workshop to the Adobe software and lynda.com. It covers the basic difference between each program and how and when to use them. This workshop is a great session to watch to ensure you and your computer are ready to start in week 1. You will need to download and install Collaborate Launcher before the session begins. Watch this video for help getting started. Please allow at least 15 minutes to get set up. Online learning is different to learning in a classroom, so its important you know the difference between all of the online platforms you will use throughout your studies. View Getting Started for everything you need to know about your online learning environment. We've also put together 10 Tips on how to succeed as an online student to help you get started! Did you know that as an online student you can still request a Student ID card, and depending on which state you're located in and whether or not you are studying full-time, you may be entitled to various student concessions? Visit Getting Started for information on how to request your Student ID card today! Just because your studying online, doesn't mean you can't visit us on campus. Check where your closest campus is located and pop in to use the Library, register to attend workshops, arrange to meet with your classmates or teachers, ask your Success Coach for help with job interviews or finding placements, or just find a comfy space to study. We get excited when our online students visit! We host Virtual Orientation sessions for our online students each trimester. Registration for our upcoming Virtual Orientation are opening soon. Did you know that online students are welcome to use any of our campuses? You can pop in to use the Library, register to attend workshops, arrange to meet with your classmates or teachers, ask your Success Coach for help with job interviews or finding placements, or just find a comfy space to study. You are also very welcome to visit Student Services at the campus that’s home to your course (see above). accessing the learning portal and your student portal. If you don't have a computer - think about how you'll get access to one for your study. For troubleshooting please email itservicedesk@think.edu.au or contact Student Services. As a Torrens University student you have free access to Studiosity, your on-demand academic literacy support service available 24/7. Start using Studiosity via Blackboard today. Take us with you on-the-go! 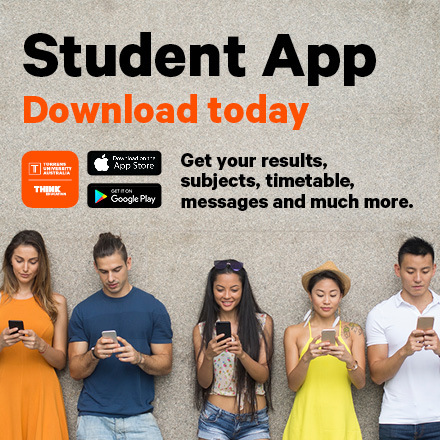 Download the Student App from the App Store or get it on Google Play today!